Video interviews, panel discussions, articles and Q&As featuring seo. Watch two competing bidders from a 6 figure domain auction meet, discussing the auction process for each of them. 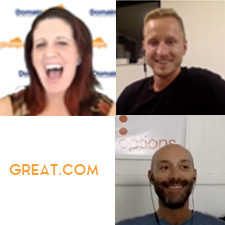 Hear the full details of a startup’s domain name search process and 6 figure domain investment from Erik Bergman, serial entrepreneur and founder of Great.com. Does Google have you guessing about your SEO strategy? Have you been slapped with a search engine ranking penalty, or worse, is your site not even showing up in the organic search results at all? This interview with an SEO veteran covers not only the current state of affairs, but where SEO is heading and how to create great content for your business. The days of thin sites, inexpensively purchased content and machine-generated websites are gone. Learn what you need to do in the future to have high-ranked sites by watching this show. In 2006, Jesse Stein purchased SportsMemorabilia.com for $12,500 when it wasn’t much more than a domain name. Fast forward several years, and the company now leads the market in high-end autographed sports merchandise and memorabilia, making $19.5 million in revenue in 2012. We start at the beginning to learn about SportsMemorabilia.com’s journey and how they plan to be a $100+ million company. Many people openly state that exact match domain names are worth more because they can get your website to the top of the search engine results. But this commonly espoused belief has rarely been backed up by real data…until today. Seventeen-year-old wunderkind Mark Collier has not only secured a substantial amount of data from various sources, but he’s taught himself programming and statistics in order to analyze the data. And he can say without a doubt – statistically speaking, of course – that exact match domain names correlate with high-ranking websites within the search engine results. Learn how Perry Rosenbloom set up affiliate websites that generate a healthy five-figure income (soon to be six-figures) on topics he loves — and with domain names you can register today. It didn’t happen overnight. It took consistent, hard work for a few years, but now his passive income affords him the flexibility to travel with his school-teacher wife during summers. Andrew Hazen knows a thing or two about marketing. In fact, he has built and sold two Internet marketing companies, pocketing millions of dollars in the process. And he has written a book using easy-to-understand language about search engine optimization. In this show, Andrew shares how he turned 90 admittedly marginal hand-registered .com domain names and one .info domain into $56,000 per month. (I have seen the Google Adsense report to verify this impressive figure.) You will be surprised to learn that in addition to search engine optimization, a clever television ad campaign drove the results. EXPERT Q&A: Singular or Plural Domain Name for Directory Site? Matt Cutts put out a video entitled “How important is it to have keywords in a domain name?” and domainers and webmasters alike all over the world took notice. His focus is on answering a users question regarding whether to go for a brandable domain name (e.g., Twitter, Facebook, Yahoo, Google) or keyword-rich domain name (BuyViagraOnline).